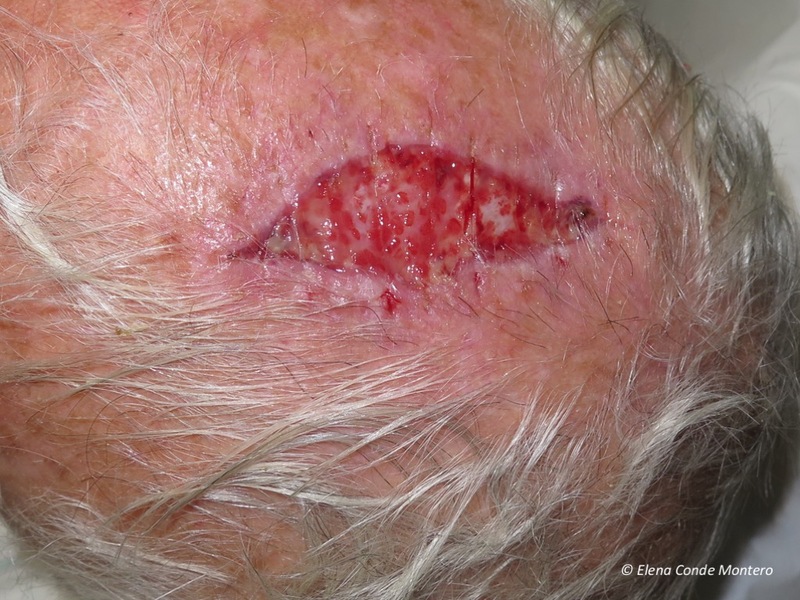 This 73 year old patient presents with a scalp wound after removal of a basal cell carcinoma. On the day of surgery, 3 weeks before, wedge resection of the tumor was performed and the edges were approached with a suture to promote healing by secondary intention. 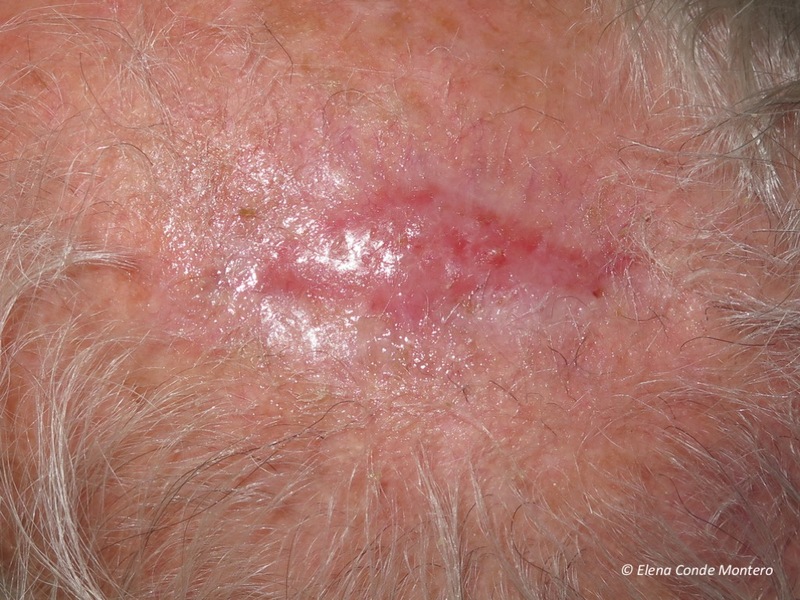 Basal cell carcinoma is the most common cutaneous malignant tumour, followed by squamous cell carcinoma. They usually occur in sun exposed areas and are surgically treated. 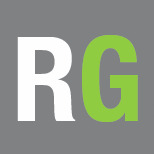 If direct closure after removal is not possible, the defect can be reconstructed with a flap or graft. Another option is, as in this case, to plan a secondary intention closure. This alternative is common in locations such as scalp or leg, or when part of a flap or graft is necrotic. 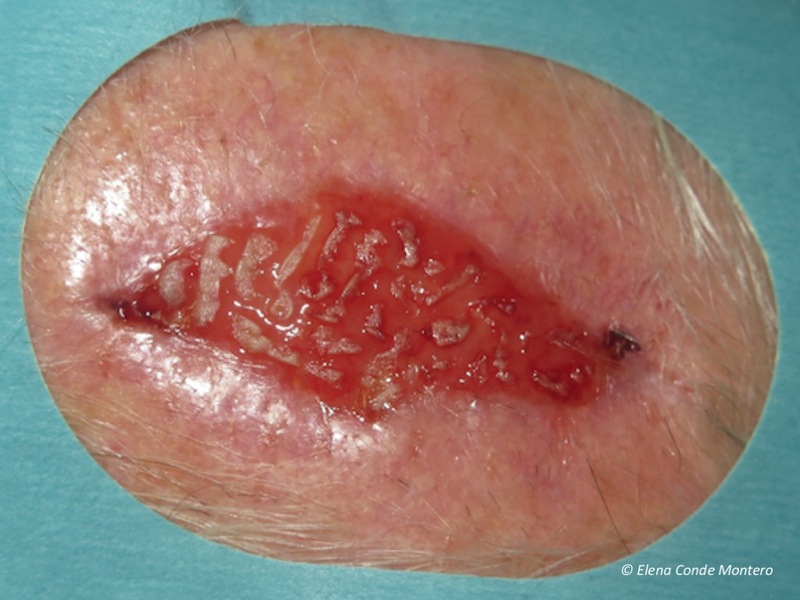 In Dermatology Departments we frequently encounter these cases and the question we usually ask ourselves is: how can we speed up the epithelialisation of these wounds? 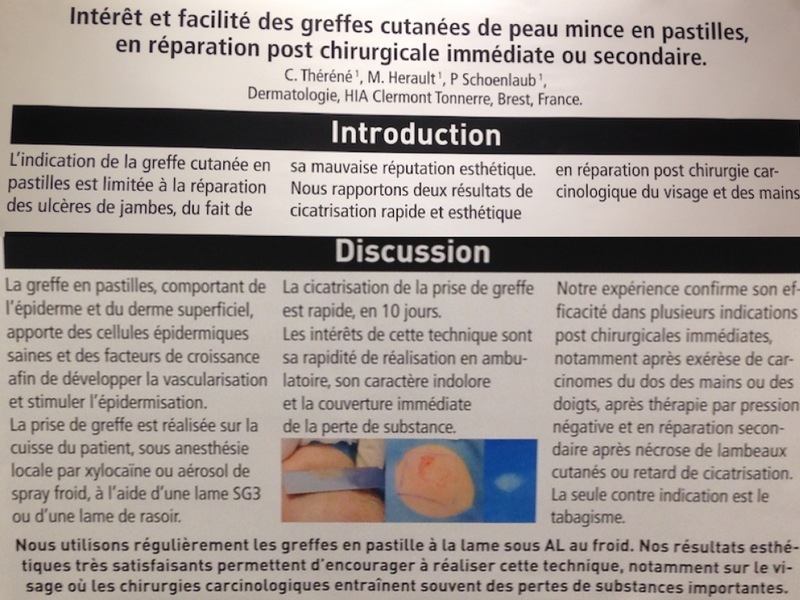 I found inspiration to use this grafting technique beyond chronic leg wounds when I read a poster in the Journées Cicatrisations 2017, in which they presented excellent results of punch grafting on a post-surgical wound on the nasal dorsum and another on the back of the hand. Here you can see what we did in the case I have presented. There are different alternatives to cover the grafted site. 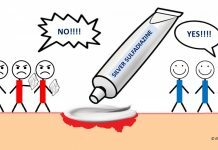 Alginate calcium dressings directly over the wound is a simple option. If we want to avoid a bulky dressing, there are flexible multi-layer dressings that adapt to complicated anatomical locations for dressing support, such as scalp. And this is the result in the second post-grafting dressing change, 2 weeks after the procedure. Obtaining the grafts with a curette in a very superficial way (epidermis and scarce papillary dermis) avoids the cobblestone effect that we may find when using the punch (circular scalpel). In fact, in small wounds with red granulation tissue after necrosis of flaps or grafts on the face, the placement of ultrathin micrografts (with minimal bleeding in the donor area) enhances the release of growth factors and keratinocytes to achieve rapid epithelialization and an excellent cosmetic result (see post: “Differences between epidermal and dermo-epidermal punch grafts”). It is important to remember that dressing changes should be spaced as far apart as possible until complete epithelialization is obtained and, in each dressing change, minimal cleansing should be performed. We have to bear in mind that a post-surgical wound that takes a long time to close is a stressful factor for the patient. Punch grafting is a simple technique, which may be performed in the consultation room, and which, in addition to promoting epithelialization, reduces pain. Therefore, it is very well accepted by the patient. I would like to end with a key message: before trying to speed up healing by grafting a post-surgical wound we have to ask ourselves what is going wrong: are there signs of infection, what factors are influencing stagnation? For example, before grafting a recalcitrant post-surgical wound on the leg, we have to consider starting compression therapy to reduce inflammation and enhance healing (See post: “Compression therapy and scar massage in leg post-traumatic or post-surgical wounds”). In post-surgical leg wounds, compression therapy and punch grafts are a successful couple in our clinical practice. Here is a case with complete epithelialization in less than a month.